Harken Jeep Top Hoisters - Overhead removal and storage for hard tops. 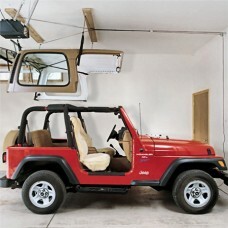 The perfect overhead Jeep Wrangler hardtop removal and storage accessory for your garage or shop. Using the Harken Jeep Hardtop Hoist, your Jeeps top (hardtop or soft top) is lifted and suspended securely from the ceiling. 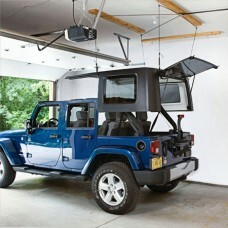 Better than other storage options because your jeep top hangs in often unused ceiling space. Mount it above your parking spot in your garage and easily remove, lift and store your canopy in seconds. The Harken Hoister system is designed to be operated easily by one person. Raises and lowers even heavy Jeep Wrangler Unlimited hardtops (up to 200 pounds) using an innovative four point design which keeps the load steady and even regardless of weight distribution. Self-locking safety kicks in instantly if the rope is accidentally released. Stainless steel hardware, double-braid rope for strength, durability and long life. The best solution for Jeep hardtop storage and removal! Our Jeep Wrangler hardtop lifts are compatible with both factory and aftermarket hardtops and soft tops on a variety of vehicles because they can handle virtually any size top within the weight limit. Everything is included for quick and easy mounting and installation in your garage, shop or other location. Please see our videos section for online Harken Jeep Top Hoister demonstrations. All Jeep Wrangler trim and options models including: SE, X, Sport, Sahara, Anniversary, Apex, Freedom, Willys, Renegade, Islander, Mountain, Arctic, Polar and more. All Jeep Wrangler 2 Door and 4 Door models. We're confident a Harken Jeep Top Hoist will be your favorite among Jeep Wrangler storage accessories. And it's not just for Jeep Wrangler and Jeep Wrangler Unlimited hardtop storage... Your hardtop hoist system can also be used to lift and store other items, anything under 200 pounds, the potential uses are endless!